Ghee is one of those classic Paleo staples that everyone seems to agree upon: it’s an awesomely healthy Paleo-friendly fat! But, this traditional food has actually been around for thousands of years as a critical component of the Indian diet (in fact, the high density of fat-soluble vitamins in ghee is a good explanation as to why a traditionally vegetarian culture was able to maintain its overall health!). Ghee, often put into the same group as clarified butter, is butter (of course, ideally this butter is grass-fed) simmered on medium-low heat until the dairy proteins (whey and casein) or “milk solids” are cooked out and become caramelized. Clarified butter generally refers to separating the milk solids without allowing them to caramelize; this mostly makes a difference in flavor but also confirms that all of the milk protein is removed, making ghee a much better choice for anyone trying to avoid whey or casein. Traditional ghee is also prepared using cultures, but this isn’t always the case in the modern world. I LOVE using ghee in my recipes, because I can feel so good about recommending that my readers use this cooking fat. It has a similar nutrition profile to the butter that it’s made from, minus the protein; ghee is approximately 60% saturated fat. Since it has such a high saturated fat content, it is a great cooking fat. As such, ghee has a very high smoke point: 485 degrees F. In fact, this is much higher than even coconut oil! This is the same reason why ghee is incredibly shelf-stable. Depending on the resources used by each company, ghee can be an excellent source of vitamins A, D, E, and K2 (the animal form of vitamin K, which can be hard to find). As you can see, your source of ghee is really important! 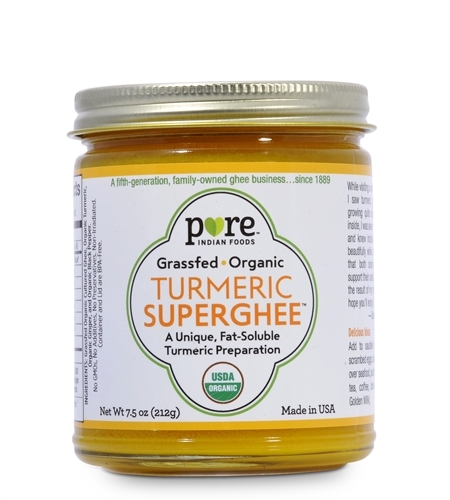 I’ve been using Pure Indian Foods Ghee for years because I really trust their preparation methods. Their Coffee ++ is a daily addition to my coffee, and their Cultured Ghee is the only dairy product my highly-reactive youngest daughter can tolerate. Their spiced ghee is made using the same process as their original ghee – clean, certified organic milk from grassfed, humanely treated cows, slowly simmered down to leave only the best flavors in the remaining Ayurvedic ghee.